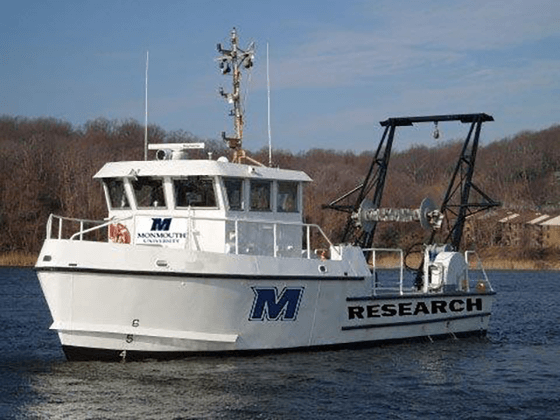 Monmouth University recently acquired the 49-foot Research Vessel (RV) Nauvoo from the National Oceanic and Atmospheric Administration (NOAA). Originally built in 1993 as a U.S. Coast Guard buoy tender, the vessel was acquired by NOAA in 2003. Due to federal fiscal constraints and a realignment of programs, the vessel could no longer be supported, and discussions began with Monmouth University for transfer of the vessel. Monmouth was able to secure transfer of ownership at no cost under the Stevenson Wydler Act, which allows federal laboratories to transfer technology to nonfederal entities. The title was officially secured by Monmouth University in late October 2017. Prior to receiving the RV Nauvoo, the University had only two small boats that served as the workhorses of our marine field operations and field research – the Little Hawk, our 18-foot Parker center console acquired with a grant from the US Environmental Protection Agency, and the Sea Hawk, our 27-foot Maycraft survey boat acquired with funding from NOAA. The 49-foot RV Nauvoo, with a life expectancy of an additional 20 years, substantially enhances our in-house research and monitoring capabilities to meet increasing faculty and student demand within our Marine and Environmental Biology and Policy Program (MEBP). The MEBP Program and the Urban Coast Institute (UCI) have developed a record of accomplishment for conducting hydrographic surveys and other projects throughout the region in coastal and inland waters, streams, and lakes. For example, we have completed debris surveys post Superstorm Sandy, mapped the state navigation channels in the Navesink and Shrewsbury Rivers, and recently completed two years of work looking for ghost crab pots in Barnegat Bay. This larger vessel will allow us to conduct undergraduate and faculty field research, and contract work in the open ocean – up to 20 nautical miles off-shore – which we have not been able to do in the past. The RV Nauvoo will be very visible and will frequently cruise throughout the area’s waterways. The vessel also provides us with the ability to upgrade to a new, larger, state-of-the-art side-scan sonar. The Norbit Integrated Wide Band Multibeam Sonar (valued at approximately $150,000), provides highly detailed views of the bathymetry in marine environments. The images appear as a detailed photograph as opposed to a sounding on a chart. This new system will provide critical support for our in-house scientists and students, and additional capacity for other local and regional institutions to work collaboratively with Monmouth University. It will also enable us to work with governmental and NGOs in areas of critical concern such as oyster restoration, shore erosion, and channel shoaling. Finally, in addition to being utilized in the MEBP Program classes and research, the new multi-beam echo sounder can be used in a special marine archeology course that Monmouth runs every summer. ‣ Because the vessel is larger than those at other universities, it will make Monmouth an attractive partner for research and contract proposals. For example, we will be able to partner with Rutgers on their current meter and mooring deployments, and work with SUNY Stony Brook on sturgeon and wind farm projects. While studying and conducting research on the RV Nauvoo, students will acquire unique skills needed to succeed in graduate school and/or in the workforce while solving real-world problems. A key objective and distinctive characteristic of Monmouth University’s Marine MEBP Program is to provide students with authentic science opportunities through field-based research and experiential learning. Professor Jim Nickels, Marine Scientist, specifically developed a course – Field Research Methods in Marine Science – to train students in field methods on board the vessels using associated equipment. The Monmouth University School of Science MEBP and the Urban Coast Institute (UCI) is on the trajectory to become the premier center for marine research and coastal policy in the state and region. The RV Nauvoo will provide students with a truly transformational learning experience, and further advance the MEBP Program and the UCI’s mission to develop the best available science to support healthy and productive coastal ecosystems and sustainable communities.